A new wave of cynical and divisive legislation known as 'Blue Lives Matter' laws is spreading across the country. 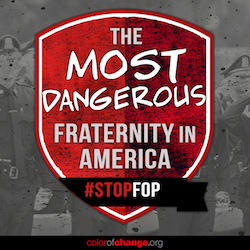 Police associations like the Fraternal Order of Police and their conservative allies are pushing a false solution to the waves of protest we've seen over the last two years. First, the Louisiana legislature passed a law that both targets activists and distorts hate crime laws beyond recognition as the first law in the country to allow people to be charged with hate crimes for conflicts with police. Now, similar bills are moving in Chicago, Tennessee, Kentucky and Pennsylvania. But worst of all, there are now 2 'Blue Lives Matter' bills introduced in Congress, making this a national problem. From its name to the legislative details, 'Blue Lives Matter' laws are intended to antagonize and discredit efforts for racial justice and police accountability by dividing the American people with a false choice between protecting Black lives and police officers. Instead of protecting law enforcement, Blue Lives Matter Bills can be used to silence the movement to hold police accountable. Activists have already faced constant backlash from law enforcement -- government surveillance, excessive jail time, tear gassing and being physically beaten by police. In the hands of local law enforcement, these new laws could mean more trumped up charges and longer sentences for protesters. Tell your members of Congress to oppose the Blue Lives Matter bills. Here's the letter we'll send your Members of Congress on your behalf. I am writing to encourage you to oppose the so-called 'Blue Lives Matter' bills that have been introduced in Congress. Both the 'Blue Lives Matter' and 'Back the Blue' acts are redundant and cynical efforts to threaten protesters and distract from the real solutions Black communities are called for. While policing can be dangerous work, there are already laws that make it a special offense to attack police. Instead of making police of communities safer, Blue Lives Matter bills that create new mandatory minimums or hate crimes only serve to exacerbate the tensions around policing. Instead of promoting 'Blue Lives Matter' bills, Police Unions and their political allies should be focused on making Black lives safer by reforming police culture and investing the resources neccesary to address the challenges created by systemic racism. Blue Lives Matter supporters have already chosen the side of cynicism and divisiveness but you can still join those of us seeking real solutions. Please opposed 'Blue Lives Matter' laws.